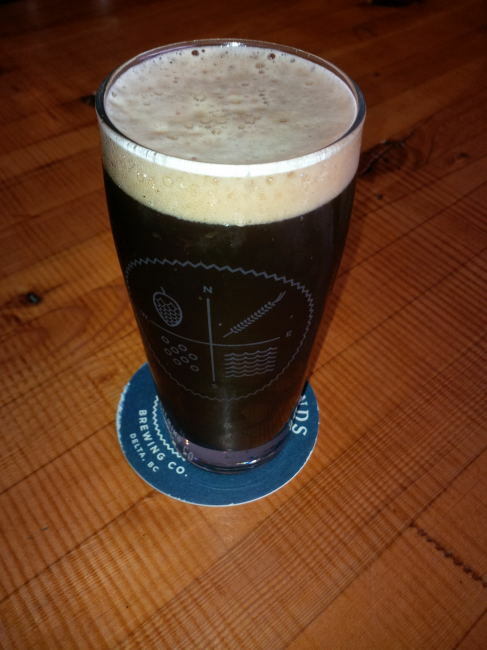 From the new Four Winds Brewing Company in Delta BC comes their very limited “Black Saison” a beer only available at the brewery. The beer pours a black/brown colour with a brown head. The aroma consists of toasty malts, pepper, yeast, fruits, oaky and some sourness from lactic acid. The flavour of this brew was of roasted malts, dark fruits, pepper, yeast, mild oak and a mild sourness. This beer was a really interesting creation being aged on Hungarian oak with Lactic acid to sour the beer. The alcohol content comes in at 6% with an IBU of 25. This beer was ridiculously good saison and Four Winds Brewing will not relent on their amazing releases. This entry was posted in Barrel Aged, Saison, Sour Ale and tagged acid, bc, beer, black saison, canada, dark fruit, dark fruits, delta, Four Winds Brewing Company, lactic, lactic acid, mild oak, mild sour, mild sourness, oak, oaky, pepper, roasted malt, roasted malts, roasty malt, roasty malts, saison, sour, sourness, yeast, yeasty. Oh my this sounds amazing! I am guessing it was on the “no growler fills” side of the board, wasn’t it? I am blown away by their limited creations, I really hope they are able to bottle (or at least growler fill) more of them soon! It sure was on the no fill side. I have a feeling that some of their limited creations will be making it into bottles one of these days.